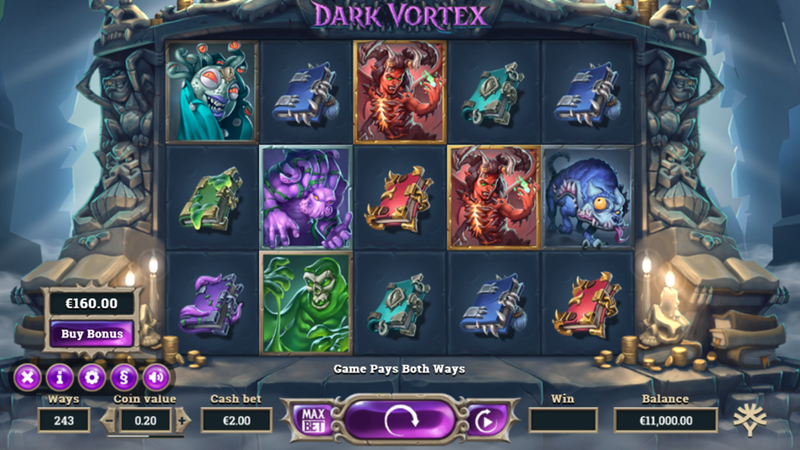 Dark Vortex is a 5-reel 3-row dark fantasy-themed video slot machine released in September 2018 by Yggdrasil that takes you to the underworld and sets a treacherous path to the jackpot of 7000x your stake. The default 243 ways to win can expand to the maximum of 3125 ways, which makes this game suitable to both newbies and high rollers. Featuring Wilds, Scatters, and Free Spins, the title introduces Vortex Reels and Buy-a-Bonus feature to further enhance your gaming experience. Read the Dark Vortex slot review to learn all important details. Want to see how Dark Vortex works? Select a recommended casino site from the list below and start playing for free or real – our screenshots will give you a sneak peek! This is a game that pays both ways, meaning that potential winners will receive a number of coins according to the paytable for combinations of 3 or more matching icons placed from the leftmost and from the rightmost. It is also possible to play for fun or for the real money on the Yggdrasil-powered sites, so each player will be able to set up his own betting strategy and wager between €0.50 and €50 per round as the coins range from €0.01 to €5. Hellish creatures, ghosts, ghouls and gargoyles are symbols with much higher rating than stylized spell books and you can receive 8 to 60 coins for a combination of 5 of a kind. The Wild can replace all other symbols but the Vortex Scatter and Orbs, appearing on the reels 2, 3 and 4 only. The Dark Vortex bonus game starts when you open all 5 Vortex reels, presuming the extra spins are still available. During this game, 3 center reels will be covered with Expanding Wilds, while only reels 1 and 5 can actually spin and introduce high-paying icons. This is how the game setting is expanded to 3125 ways to win and this is where you can score the big win of 7000x your initial stake. Opening 5 Vortex reels activate the Dark Vortex Free Spins and a chance to trigger the bonus game closely described above. This will also make the dark portal to retract 3 to 5 reels, while each new adjacent Vortex symbol comes with 2 extra spins. Moreover, Pink Orbs may appear on the reels 1 and 5 and create a stack of Wilds. A pack of Blue Orbs may land on central reels and each comes with 1 additional free spin. Additionally, pay 800 coins to activate Free Spins immediately. Thanks to the latest HTML5 technology, you can play the game on a mobile device without having to download the iPhone app or the Android .apk file. 3. What is the RTP factor of Dark Vortex? The RTP stands at 96.50%, according to the official info. Using the unique Buy-a-Bonus feature and paying an extra sum of 80 coins, players may activate free spins game directly and increase the RTP to 97.00%. The Dark Vortex recension deal with one of the Yggdrasil’s flagship titles for 2018 that really has a lot of potential to shake up the scene. This is a game that brings an attractive major prize and practically unlimited extra spins, presuming your winning streak is unbroken. A variety of betting combinations made it suitable for an extended range of interested parties.